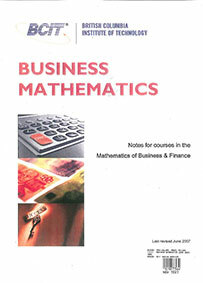 Reviews basic mathematics applicable to business and industry. Topics include consumer and commercial credit, simple and compound interest, financial instruments and discounting, annuities, mortgages, loans, sinking funds, leases, depreciation methods, capitalized costs, cash flow analysis, NPV and IRR. Emphasis is on maximum use of pre-programmed calculator and practical applications from the field of Financial Management. Algebraic skills to at least the Grade 11 level with a minimum 68% final mark. Students who do not have these skills should consider taking OPMT 0199 Math for Business or OPMT 0198 Business Math Assessment Test. $593.85 - $600.99 See individual course offerings below for actual costs. Below are 10 offerings of this course for the Spring/Summer 2019 term. This is an online learning course. Start any time. You have 30 weeks from the date you register to complete this course. A textbook and a course manual must be purchased at: BCIT Bookstore or online at: www.bcitbookstore.ca/distance/ Students must submit email address when registering. To be successful in our online courses, plan to spend 7-10 hours per course each week on your studies, starting Week 1. This is an online learning course. Start any time. You have 24 weeks from the date you register to complete this course. Online registration for this course offering is not available. However, you can still register via phone, mail or in person. No class on April 22, May 20th and July 1st. This course is very intense. It is designed primarily for students who have taken a similar course and want to improve their grade. Identify the problem (e.g., to choose the most economical equipment). Formulate the problem elements into mathematical relationships and models. Use appropriate technology to assist in problem solving. Manipulate the relationship and models to provide a solution to the problem. Apply concepts of proportion and percent to business areas such as markup, discounts, budget allocation. Utilize standard functions and graphical techniques to analyze relationships between quantities such as cost, revenue, production volume and profit. Apply the concept of the time value of money. Calculate interest, present and future values using simple interest. Calculate interest, present and future values using compound interest. Analyze interest rates by finding equivalent and effective rates. Calculate payments, present and future values for annuities in budgeting and asset evaluation and for mortgages. Calculate and compare interest on various forms of debt or investments. Create and use amortization tables for various debt instruments. Interested in being notified about future offerings of OPMT 1110 - Business Mathematics? If so, fill out the information below and we'll notify you by email when courses for each new term are displayed here.